The Isabella Stewart Gardner Museum has been experimenting a bit with this season’s concert series, taking some its most popular acts and giving them on Saturdays to complement their usually sold-out Sundays. Thus, A Far Cry gave the first of the second round of its fall concerts yesterday with a typically mixed and imaginative offering of 19th-, 20th -, and 21st– century pieces. To these ears the results were also somewhat mixed, but the audience in the substantially populated Calderwood Hall seemed enthusiastic. The brief closing movement, “Benediction,” from Leonard Bernstein’s last orchestral work, the variously named Concerto for Orchestra—also called Jubilee Games, dating from 1986-89, began, in an arrangement by Crier Alex Fortes, with a robust fanfare for solo trumpet (Ben Thurston, with commanding presence and clarion tone) that, over the movement’s six-minute span, subdues itself in stages to muted, and then offstage to conclude, as the baritone steps in (the normally stalwart David Kravitz suffering a bout of intonational wobbles) with the Hebrew text of Numbers 6:24-26 (“The Lord bless you and keep you…”), to a tune that sounds (but isn’t) lifted from Chichester Psalms. The arrangement struck us as quite successful, toning down the original’s orchestral brassiness to a serene dignity. AFC contributed, as it did throughout the afternoon, impeccable security of pitch and solidarity of ensemble. 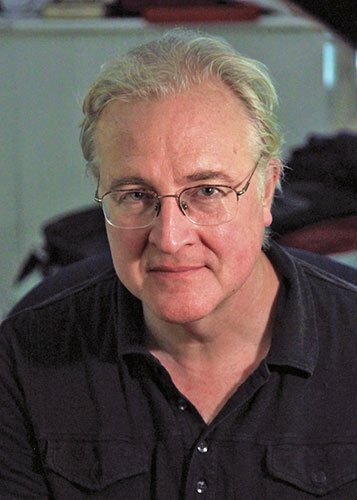 There followed the first of the two numbers that commended this program to us, Paul Moravec’s 2003 Morph. The composer, on hand to provide historical and literary context to the rather formalistic booklet notes by Paul Griffiths, pointed out that not only is there musical morphing going on (a motif comprising a third surmounted by a second that operates in small and large ways), but that the work is a rather precisely realized tone poem out the myth of Apollo and Daphne from Book I of Ovid’s Metamorphoses, as reified in Bernini’s famous sculpture in Rome’s Galeria Borghese. Moravec, whose Tempest Fantasy won the 2004 Pulitzer Prize, is not that often performed hereabouts, which is a pity; perhaps his idiom is insufficiently abstruse, though his craft is impeccable and his communication skills vibrant. As Griffiths pointed out, Morph is scored similarly to Vaughan Williams’s Tallis Fantasia, with a string quartet concertino against a massed string ripieno. In execution, though, the division of groups was less clear-cut till the closing pages, where the quartet carried much of the musical argument. After a forceful opening, a mournful vein obtained, fueled by Daphne’s aversion to her suitor. The sound is not much reminiscent of RVW either, offering more of Frank Bridge or early Britten. The denouement after the climax (presumably when Daphne is transformed into a laurel tree—that’s the trouble with tone poems, only the composer is privy to the exact scenario) seemed overly drawn out. Despite the virtues noted above, AFC’s reading seemed oddly cool—could the composer’s presence have inhibited expressive flexibility in favor of precise accuracy? The rather long forepart of the concert continued with Source Code by Jessie Montgomery, with whose work we were totally unfamiliar. 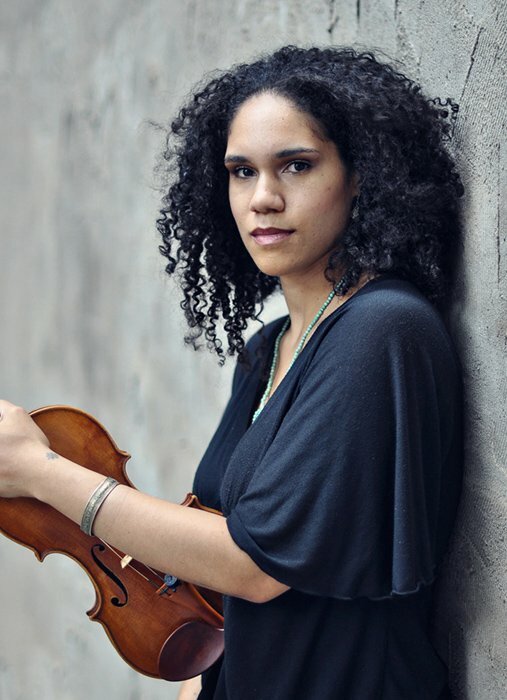 Existing in string quartet and string orchestra versions, it attempts, as the composer put it, to find a common thread among various African-American artists in varying forms (e.g. poetry, dance, song), and finding it in Gospel. Formally, it starts with repeated unisons and gradually unfolds into a set of melodic, then rhythmic, then harmonic fragments combining into longer strings limning key elements of the Gospel idiom. It’s a charming and engrossing composition that merits repeated hearing. It does strike us a bit strange, though, that Montgomery is so keen to keep her New York detachment in place that she doesn’t really engage with the idiom in its fullness, as many of her musical forebears have done, notably the remarkable Florence Price. Still, this is a young-ish composer for whom one should keep ears peeled. Another anticipated work closed the first half, the Concerto for String Orchestra (1948) by Polish composer (she was, in fact, Lithuanian on her father’s side, and half her siblings chose to identify as such, spelling their surname Bacevičius) Grażyna Bacewicz (1909-1969), whose output is little known outside her home turf, owing perhaps to having been overshadowed by her rough contemporary Lutosławski. Her catalogue contains riches among which is this concerto in the Brandenburg vein, whose neoclassicism has had its corners rounded, whether as a matter of the composer’s personal taste or the better to ingratiate herself with (or insulate herself from) the strictures of Zhdanov-era censoriousness. The opening movement, if one didn’t know it was by a Polish composer, could have come from the workshop of Villa-Lobos (Bachianas Polonienses? ), but it featured some strongly motoric rhythms suggestive of Bernard Herrmann (North by Northeast?). The slow movement presented a highly atmospheric and sonorous surround to a nubbly yet lyrical melody carried for the most part by solos, notably by viola (Celia Hatton, sounding gorgeous) and cello (Rafael Popper-Keizer, likewise). The finale was jolly and yet slightly jagged, with a lyrical center of deep resonance again reminding us of the Brazilian master. The performances were faultless; let’s hear more Bacewicz, please! Popper-Keizer’s transcription of Edvard Grieg’s only string quartet, his G minor, op. 27, constituted the second half. Certainly it can make sense to arrange or transcribe for an instrumental grouping different from the original, especially when the target ensemble doesn’t have a large repertoire. A transcription such as Fortes’s of the Bernstein can also serve as a commentary on or transformation of the original. In some cases, composers themselves undertake this transformation, as Montgomery did with her piece, and indeed as Grieg did with his From Holberg’s Time, “Suite in olden style,” from solo piano to string orchestra. But one should never think, “gee, that’s a nice string quartet, let’s play it with our string orchestra.” That requires a pretty substantial justification in our book, since the scaling up forfeits the intimacy and intense inflection of the quartet genre and risks muddying the individual parts; the gain in resonance and force of the larger ensemble had better be at least equal to that loss. Popper-Keizer seems to have felt that the Grieg was proto-symphonic in its ambitions: in introducing the piece, in addition to quoting a comically awful review of the quartet’s 1878 premiere, he adverted to its free employment of double-stops to justify his orchestral enlargement. And then again—and here we’re expecting brickbats to come flying—there’s the problem of, well, Grieg. He only completed a handful of works in larger forms, notably the Piano Concerto, but also an early piano sonata, three sonatas for violin and one for cello, plus this quartet. His forte was the lyric piano morceaux. His gifts were melodic and, to a minor extent, harmonic, plus of course his remarkable ability to invoke the “northern” atmosphere. He worked from a small arsenal of compositional procedures (theme, restate it at a different interval, restate it at another interval, crunch some chords) and a dozen or so stock motivic cells from which he constructed his melodies. Amazingly, his tunes are often quite memorable, as long as you don’t have to listen to so many similar ones in one piece, which is kind of necessary in his multi-movement works. Of true symphonic development he was clueless, or maybe he was just indifferent. He parodies well (for a brilliant example, catch the Grieg variation, at 1:34, of Edward Ballantine’s Variations on Mary Had a Little Lamb in the Styles of Ten Composers, here as iffily orchestrated by the indomitable Nathaniel Shilkret). Having said all that, AFC’s rendition wasn’t bad, and Popper-Keizer’s orchestration is certainly aware of and largely avoids the pitfalls. The ensemble resonated where called for, and offered up fine degrees of dynamic shading. For our money, though, we’d stick with the original.